جنگ ووئللی میں کھویا علاقہ (ہلکا نارنجی). ↑ After the defeat at Vouillé (507) and the loss of Toulouse. See: S. J. B. Barnish, Center for Interdisciplinary Research on Social Stress, The Ostrogoths from the migration period to the sixth century: an ethnographic perspective (Boydell & Brewer Ltd, 2007), p. 368. ↑ Following the death of Amalaric (531). See: S. J. B. Barnish, Center for Interdisciplinary Research on Social Stress, The Ostrogoths from the migration period to the sixth century: an ethnographic perspective (Boydell & Brewer Ltd, 2007), p. 369. 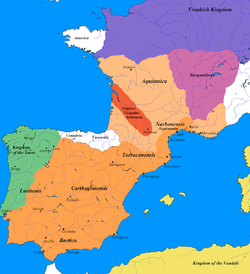 ↑ Capital of the Visigothic kingdom by the end of the reign of Athanagild (died 567). See: Collins, Roger. Visigothic Spain, 409–711 (Oxford: Blackwell Publishing, 2004), p. 44.